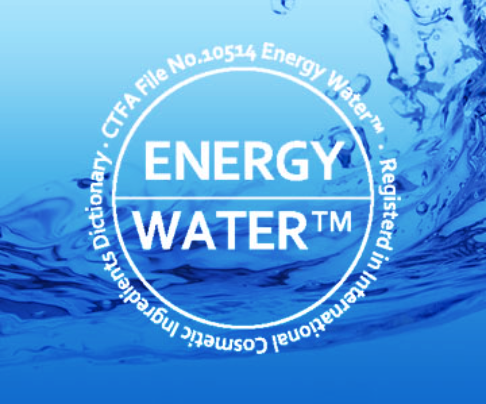 Registered at ICID(International Cosmetic Ingredient Dictionary), Energy Water is functionally most optimized water to maintain a life phenomenon. Re-constructing molecular arrangement of water enhances its structural order, reduces entropy (entropy=molecular disordering, i.e. causes of ageing). Containing restorative power of abnormal cells and information of bio-balance, Energy Water helps to restore human body to its original healthy orderly state and restore abnormal cells to tis healthy condition. Energy Water helps human body to overcome the disorderly surroundings and recover its orderly state by creating a healthy environment from inside and out. Adding electromagnetic force from the outside and a small amount of inorganic ion restores order to the molecular structure of water. Lastly, entering water molecule related information to the energy wavelength creates Energy Water. Information encoded and entropy lowered Energy Water helps to restore the damaged human body system to an orderly healthy condition, and by doing this, a disorderly gene becomes extinct and a normal gene is created. 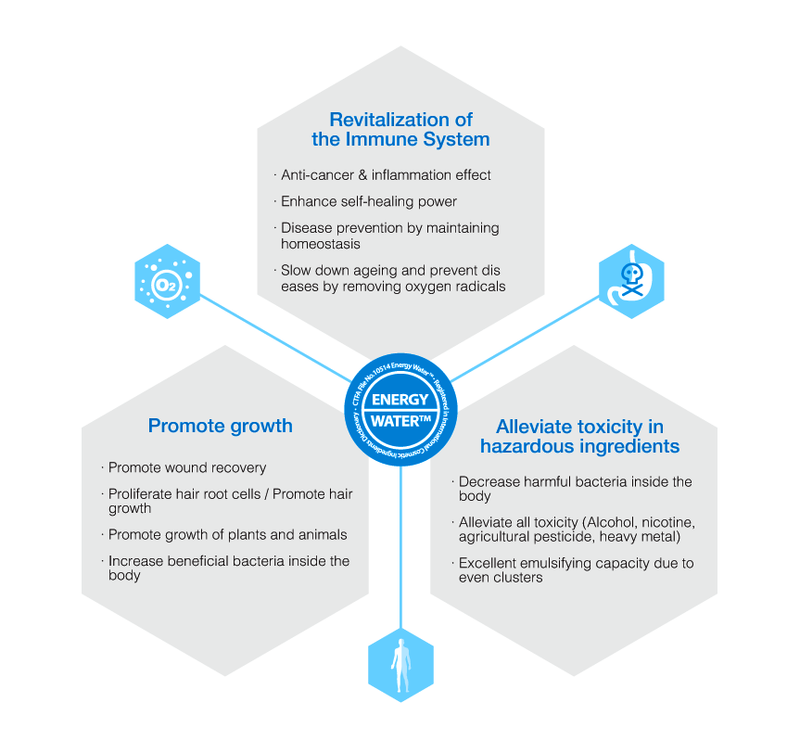 Revitalization of the immune system, growth promotion, and alleviating toxicity from hazardous materials are among the benefits of Energy Water. 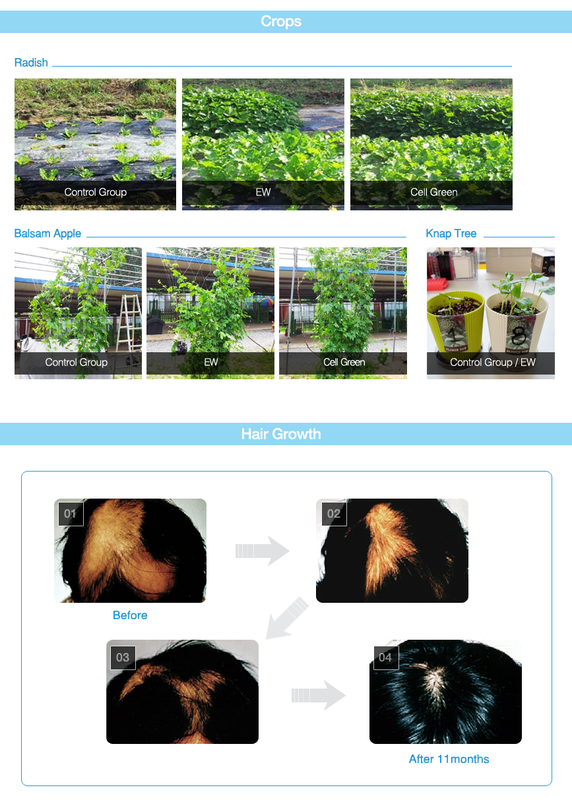 Research outcome of antioxidation, anti-cancer effect and growth promotion is as follows. * Above are a joint research outcome by Biochemistry School, Korea Molecular Medicinal Nutrition Research Institute at Korea University Medical School and the MetaBio Research Institute. In Energy Celgen Water Concentrate, structural order in the molecular arrangement of water has been restored from external electromagnetic force. Furthermore, entropy reduced and information encoded Energy Water helps to return the damaged body system to its original healthy condition. Due to pollution and bad living habit, men suffer from imbalance and lack of harmony in the body which leads to generation of wrong genetic information. 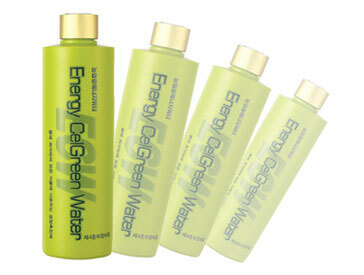 Energy Water helps to restore order in such body, to extinguish wrong genes and reveal healthy genes. 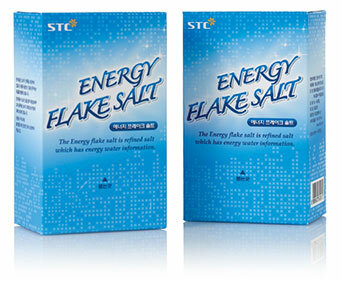 In other words, information encoded into the Energy Water works to gradually restore the damaged genetic information in our body at the stage where DNA and RNA information are delivered..
Energy Salt is manufactured using Energy Water, based on the special know-how of STC life science R&D center and mimics the functions of Energy Water. In other words, Energy Water information is encoded and the liquid that comes into contact with it performs like Energy Water. 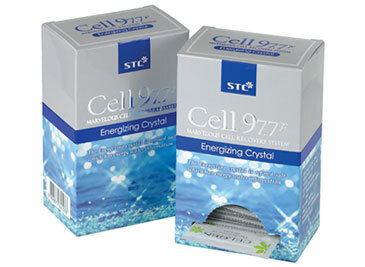 With a molecular structure made of Energy Water and Salt Crystals, Cell97.7 Energizing Crystal(purified salt) may be used for different purposes in many ways. Mix purified water and salt in 200:1 ratio. Store it in the refrigerator for 24 hours for aging. 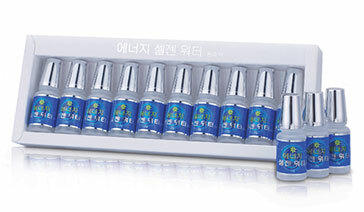 Diluted Energy Crystal solution may be used in various ways such as a soothing pack to calm sensitive skin. A gauze or cotton pad is to be wet with it sufficiently and an immediate calming effect appears. In a modelling mask pack, it provides a brightening effect as well as a calming effect. Energy CelGreen Water is a concentrate made by adding mineral nutrients for easy absorption by plants, into the Energy Water that has passed through different volcanic rocks transmitting far infrared rays and magnetic with magnetic fields, containing inorganic components. Energy Water fertilizers supply optimal water and nutrients for the cell functioning to enable the plant to self-control its immune system to protect itself from diseases. Furthermore, it aids to reinforce the plants’ natural healing power by creating a healthy environment within the plant. As a supply source for enzymes that invigorates the soil microbes, not only does CelGreen Water boost metabolism but it also aids to buffer and break down toxicity in the pesticides. Moreover, it helps to prevent diseases by inhibiting activation of the pathogens that incur sickness or toxic materials that impedes growth and development of the plants and crops. 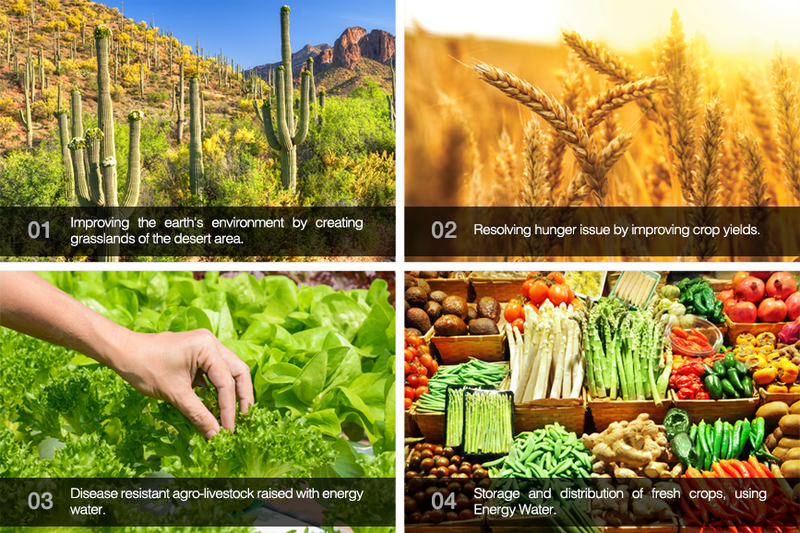 With Energy CelGreen Water, we become closer to realizing environment friendly farming that produces high quality and safe-to-eat crops.